It’s spring break at the University of Virginia, and we want to supplement your beach reading — or replace a trashy novel — with sophisticated fare that will impress your friends. So this week we present an excerpt of Alan Abramowitz’s concluding chapter in The Surge, the U.Va. Center for Politics’ new book about the 2014 and 2016 elections. Abramowitz explores the fundamentals that will impact the 2016 environment and help determine our next president. 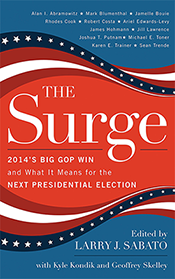 Full of detailed analysis of the 2014 election outcome and insight on what to expect in 2016, The Surge is now available for pre–order and will be released next week. Although most Americans are probably still recovering from the incredibly long, expensive, and negative 2014 midterm election campaign, it is clear that the 2016 presidential campaign is already well under way. The identities of the Democratic and Republican presidential candidates will probably not be known until March or April 2016 at the earliest. But whether Hillary Clinton does or does not end up as the Democratic nominee, and regardless of who wins the Republican nomination, there are many things that we already know about the first presidential election of the post-Obama era. What we know is based on longstanding trends in American politics and well-established features of the presidential selection process. Some of the most important things that we already know about the 2016 presidential election involve the characteristics of the American electorate in the second decade of the 21st century. One thing we already know is that the 2016 electorate will be much larger than the 2014 electorate. Despite record campaign spending and intense voter mobilization efforts by candidates, parties, and outside groups, turnout in the 2014 midterm elections was extraordinarily low. According to data compiled by Michael McDonald’s United States Elections Project, only 36% of eligible voters cast ballots in 2014. It was the lowest turnout in a midterm election since 1942. And the decline in turnout from 58% in 2012 to 36% in 2014 was the largest drop in turnout between a presidential and midterm election since 1940-1942. Approximately 83 million Americans cast ballots in the 2014 midterm election compared with over 130 million in the 2012 presidential election. In other words, 47 million voters dropped out of the electorate between 2012 and 2014. Midterm elections have always been characterized by much lower turnout than presidential elections. However, the difference in turnout between these two types of elections has been especially large in recent years, and this growing gap between the presidential and midterm electorates has had important political consequences. Although lower turnout in midterms affects every group in the electorate, it especially affects the types of voters that Democrats now rely on very heavily — younger voters, racial and ethnic minorities including Latinos, and unmarried women. Midterm elections almost always result in losses for the president’s party, but the results of recent midterm elections have been especially bad for Democrats due to their party’s growing dependence on groups of voters with especially high dropout rates in midterm elections. Because 2016 is a presidential election year, voter turnout will be much higher than it was in 2014. It is therefore safe to predict that the 2016 electorate will look much more like the 2012 electorate than like the 2014 electorate. The 2016 electorate will be considerably younger, less white, and almost certainly more Democratic than the 2014 electorate. In fact, based on the expected replacement of predominantly white older voters departing the electorate by much more racially diverse younger voters entering the electorate, the 2016 electorate is very likely to have a smaller proportion of non-Hispanic whites and a larger proportion of Latinos and other nonwhites than the 2012 electorate. Even without Barack Obama at the top of the Democratic ticket, demographic trends almost guarantee that the nonwhite share of the electorate will continue to grow over the next several election cycles at about the same rate that it has been growing since the early 1990s. A reasonable guess would be that nonwhites will make up about 30% of the 2016 electorate with Latinos comprising around 11% of the electorate. None of this means that Republicans cannot take back the White House in 2016. When it comes to presidential politics, demography is not destiny — the outcome of the next presidential election will depend on a variety of factors besides the racial and ethnic composition of the electorate, including the state of the American economy and voters’ evaluations of President Obama’s job performance in 2016. Moreover, Democratic gains due to the party’s growing support from African Americans, Latinos, and other nonwhites have been offset to a considerable extent by a substantial erosion of Democratic support among white working-class voters since the early 1990s. In 2014, for example, Republican House candidates defeated Democratic House candidates by a whopping 30 percentage points among white voters without a college degree, according to the national exit poll. The ability of the 2016 Democratic presidential candidate to reduce the Republican margin among white working-class voters, who were once a vital component of the Democratic electoral coalition, may be just as important as turnout among nonwhites in determining the outcome of the election. What we can predict with a high degree of confidence even at this early stage is that individual voting patterns in 2016 will closely resemble those in 2012, the electoral map in 2016 will closely resemble the electoral map in 2012, and party loyalty and straight-ticket voting will be the rule in 2016 just as in 2012. With the country closely divided between supporters of the two parties, this means that the outcome in 2012 is likely to be very close unless one party or the other chooses a candidate so extreme as to alienate large numbers of moderate partisans and independents. In the first two decades of the 21st century, the United States has entered a new era of electoral competition. This new era of competition has three main characteristics that distinguish it from the patterns of electoral competition that were evident for half a century following the end of World War II. First, there is a close balance of support for the two major political parties at the national level, which has resulted in intense competition for control of Congress and the White House. Second, despite the close balance of support between the parties at the national level, there is widespread one-party dominance at the state and local level. Third, there is a very high degree of consistency in the outcomes of elections over time and across different types of elections. These three characteristics are closely related. All of them reflect the central underlying reality of American electoral politics in the current era: an electorate that is strongly partisan and deeply divided along racial, ideological, and cultural lines. While swings in party control of the White House occurred frequently between the 1950s and 1990s, many of the elections during those years were decided by very large popular vote margins. 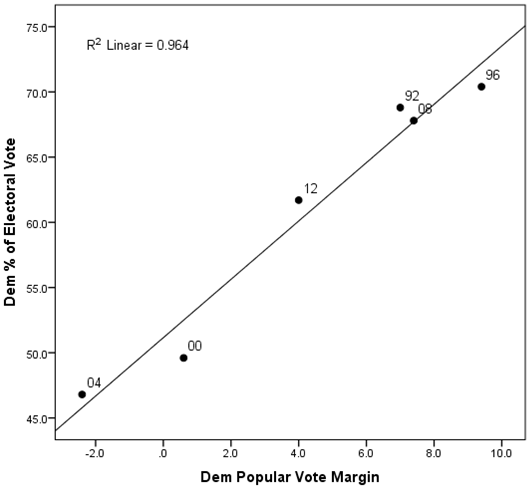 In contrast, the popular vote margins in recent presidential elections have been fairly small. Of course there have been closely contested presidential elections throughout American history, but there have also been many landslide elections in which one candidate defeated his opponent by a margin of 10 percentage points or more in the popular vote. In fact, during most of the 20th century, landslide elections were the rule and not the exception. Of the 17 presidential elections between 1920 and 1984, 10 were won by a double-digit margin. But there hasn’t been a landslide election since Ronald Reagan’s drubbing of Walter Mondale in 1984. The 2012 results continued the recent pattern of presidential elections that are decided by a narrow margin at the national level but by a landslide or near-landslide margin in many states. This pattern of many deep red and blue states, including several of the nation’s most populous states, represents a dramatic change from the pattern of electoral competition seen in close presidential elections during the 1960s and 1970s. In 1960 and 1976, when John F. Kennedy and Jimmy Carter won close, hard-fought battles for the White House, 20 states were decided by a margin by less than five percentage points. Moreover, in those elections every one of the nation’s most populous states was closely contested, including California, Illinois, New York, and Texas. In 1976, states decided by less than five points accounted for 299 electoral votes while states decided by 15 points or more accounted for only 66 electoral votes. In 2012, in contrast, states decided by less than five points accounted for only 75 electoral votes while states decided by 15 points or more accounted for 289 electoral votes. We can be confident that the 2016 electoral map will closely resemble the 2012 electoral map. The large majority of states that voted for Obama in 2012, including almost all of the states carried by Obama by 10 points or more, are very likely to end up in the Democratic column while the large majority of states that voted for Romney in 2012, including almost all of the states carried by Romney by 10 points or more, are very likely to end up in the Republican column. The outcome of the election will once again be decided by a relatively small number of swing states, almost all of which were swing states in both 2008 and 2012. While there could be some additions or subtractions from the group of swing states, it would be very surprising if Colorado, Florida, Iowa, New Hampshire, North Carolina, Ohio, Pennsylvania, Virginia, and Wisconsin are not major battlegrounds in 2016. The remarkable consistency in the results of recent presidential elections as well as the large number of deep blue and deep red states can both be explained by the fact that the American electorate today is sharply divided along party lines. The results of elections closely reflected the underlying strength of the parties and the fact that while the nation as a whole is closely divided between supporters of the two parties, the large majority of states now clearly favor one party or the other. The partisan divide was clearly evident in the results of the 2012 election at the individual level as well as at the state level. Thus, according to the national exit poll, 93% of Republican identifiers voted for Mitt Romney while 92% of Democratic identifiers voted for Barack Obama. This was the highest level of party loyalty in any presidential election since the beginning of exit polls in 1972, and it continued a pattern of strong partisan voting by Democratic and Republican identifiers in recent presidential elections. Data from the 2012 American National Election Study confirm this pattern: 91% of party identifiers, including leaning independents, voted for their own party’s presidential candidate while only 7% defected to the opposing party’s candidate. This was the highest level of party loyalty in any presidential election since the ANES began asking the party identification question in 1952. Independents made up 29% of the electorate according to the national exit poll, and they divided their votes relatively evenly — 50% for Romney to 45% for Obama. But that 29% figure undoubtedly exaggerates the significance of the independent voting bloc because the exit poll does not ask independents whether they usually lean toward one party or the other. Based on data from the ANES and other surveys, however, we know that the large majority of self-identified independents lean toward a party and that these leaning independents vote very similarly to regular partisans. In fact, in recent elections, leaning independents have been more loyal to their party than weak party identifiers. In the 2012 ANES, 72% of independent voters leaned toward one of the two major parties and only 9% of these leaning independents defected to the opposing party’s presidential candidate compared with 14% of weak party identifiers. The high levels of party loyalty and straight-ticket voting in 2012 extended a trend that has been evident in American elections for some time. Recent elections have seen consistently higher levels of party loyalty and straight-ticket voting than elections from the 1970s and 1980s. Both increased party loyalty and increased partisan consistency in voting reflect the fact that over the past several decades, the party divide has become increasingly associated with other, deeper divisions in American society: a racial divide between a declining white majority and a rapidly growing nonwhite minority, an ideological divide over the proper role and size of government, and a cultural divide over values, morality, and lifestyles. Over the past several decades, growing racial, ideological, and cultural divisions within American society have resulted in a growing divide between the electoral coalitions supporting the two major political parties. This can be seen in Table 1, which compares the racial and ideological composition of the Democratic and Republican electoral coalitions in 1972 and 2012 based on data from the American National Election Studies. The results in this table show very clearly that in terms of race and ideology, the Democratic and Republican electoral coalitions are much more distinctive today than they were in 1972 — and the contrast would undoubtedly be even greater if we could go back further in time. Unfortunately, we cannot because the ideology question was not added to the ANES survey instrument until 1972. In 1972, while conservative whites made up the single largest Republican voting bloc, they were less than half of all Republican voters, and they barely outnumbered moderate whites. In 1972, moderate-to-liberal whites actually outnumbered conservative whites among Republican voters. In contrast, in 2012, conservative whites made up more than two-thirds of Republican voters, greatly outnumbering moderate and liberal whites combined. In terms of its electoral base, the Republican Party is much more conservative today than it was in 1972. And while nonwhites comprise a slightly larger proportion of GOP voters today than they did in 1972, they remain a very small minority of Republican voters despite the dramatic increase in the minority share of the overall electorate during these four decades. African Americans made up only 1% of Republican voters in 2012 compared with 23% of Democratic voters. Moreover, although nonwhite Republicans are somewhat more moderate than white Republicans, they are much more conservative than nonwhite Democrats. According to the data from the 2012 ANES survey, 66% of nonwhite Republican voters described themselves as conservative compared with only 15% of nonwhite Democratic voters. Nonwhite Republicans were only slightly less conservative than white Republicans, 77% of whom chose the conservative label. The presence of a relatively small group of rather conservative nonwhite Republicans has very little impact on the overall conservatism of the modern GOP base. The Democratic electoral coalition has also undergone a makeover since 1972. In the case of the Democrats, however, the result has been to increase the influence of nonwhites and white liberals at the expense of moderate-to-conservative whites. In 1972, moderate-to-conservative whites made up about three-fifths of Democratic voters. In contrast, in 2012, moderate-to-conservative whites made up only about one-fourth of Democratic voters. Today’s Democratic electoral coalition is dominated by nonwhites and white liberals. These two groups together made up only about two-fifths of Democratic voters in 1972. In 2012, they made up about three-fourths of Democratic voters. As a result of these changes, the center of gravity of the Democratic Party in the electorate has shifted considerably to the left of where it was in the 1970s. The electoral coalition that put Barack Obama in the White House was very different from the one that put Jimmy Carter in the White House or even the one that put Bill Clinton in the White House. Will it be time for a change? It is easy to predict that voting patterns in the 2016 presidential election will closely resemble those seen in 2012, that the electorate will be sharply divided along party lines, and that the outcome will be decided by a fairly small number of swing states, most of which were also swing states in 2008 and 2012. However, it is much harder to predict something else about the 2016 presidential election: who will win. We know that President Obama will be completing his second term in 2016, which means that the Democratic nominee will be trying to do something that is always difficult: hold the White House for her party for a third consecutive term. That has only happened once since 1952, when George H.W. Bush succeeded Ronald Reagan in 1988, although Al Gore likely would have repeated the feat in 2000 if not for a host of problems with the vote-counting in the state of Florida. Three second-term elections resulted in narrow defeats for the president’s party (1960, 1968, and 1976) and three resulted in decisive defeats (1952, 1992, and 2008). On average, however, these elections have been close: the candidate of the president’s party has won an average of 49.1% of the major-party vote in second-or later-term elections since World War II. Two other variables that appear to influence the outcomes of third-term presidential elections like 2016 are the condition of the U.S. economy and the public’s evaluation of the current incumbent’s performance. In the three third-term elections since World War II in which the president’s party won the popular vote — 1948, 1988, and 2000 — the incumbent president’s approval rating was an average of 17 points higher than his disapproval rating at the time of the election, and real GDP grew by an average of 4.2% during the year of the election. In contrast, in the six third-term elections in which the president’s party lost the popular vote — 1952, 1960, 1968, 1976, 1992, and 2008 — the incumbent president’s approval rating was an average of three points lower than his disapproval rating and real GDP grew by an average of 3.4% during the year of the election. In the six third-term elections without a running incumbent, the contrast between the electoral environments for successful and unsuccessful incumbent party candidates is even sharper. In the two open-seat elections in which the president’s party won the popular vote — 1988 and 2000 — the incumbent president’s approval rating was an average of 15 points higher than his disapproval rating, and real GDP grew by an average of 4.1%. In the four open-seat elections in which the president’s party lost the popular vote — 1952, 1960, 1968, and 2008 — the incumbent president’s approval rating was an average of eight points lower than his disapproval rating, and real GDP grew by an average of only 2.9% during the year of the election. Can the Electoral College save the Democrats? Of course, the outcome of the 2016 presidential election will be decided by the electoral vote, not the popular vote, and the electoral vote is based on the election results in the states. Table 2 displays the results of the 2012 election in the states along with the number of electoral votes cast by each state. Safe states were won by a margin of at least 15 points, solid states were won by a margin of 10 to 15 points, leaning states were won by a margin of five to 10 points, and toss-up states were won by a margin of less than five points. The results of presidential elections at the state level have been remarkably stable since 2000, with 40 states and the District of Columbia supporting the same party in all four elections. Based on these results, the Democratic candidate in 2016 is very likely to carry the District of Columbia and 15 states with a total of 191 electoral votes that Barack Obama won by at least 10 points in 2012. Fourteen of those states along with DC have voted for the Democratic candidate in every presidential election since 2000, and New Mexico, which supported George W. Bush in 2004, has shown a clear Democratic trend since that year as a result of its growing Latino electorate. Likewise, the Republican candidate in 2016 is very likely to carry 20 states with a total of 154 electoral votes that Mitt Romney won by at least 10 points in 2012. Nineteen of these states have voted for the Republican candidate in every presidential election since 2000, and Obama’s narrow victory in Indiana in 2008 looks like a one-time aberration given Mitt Romney’s double-digit margin in 2012 and the Hoosier State’s record of voting for every other Republican presidential candidate since World War II except Barry Goldwater in 1964. The results in Table 2 suggest that the Democratic candidate in 2016 will start off with a somewhat larger bloc of electoral votes that she can count on compared with the Republican candidate. In addition, there are eight states with a total of 81 electoral votes that Obama carried by a margin of between five and 10 points in 2012, compared with only three states with a total of 37 electoral votes that Mitt Romney carried by a margin of between five and 10 points. If the Democratic nominee just carries DC and all of the states that Obama won by at least five points in 2016, that would give her a total of 272 electoral votes, which would be two more than the 270 needed to win the election. The question raised by these results is whether, notwithstanding what happened in the 2000 presidential election, Democrats now enjoy an advantage in the Electoral College so that even if the Democratic candidate loses the popular vote by a relatively narrow margin, she would have a good chance of winning the electoral vote. However, an analysis of the relationship between the popular vote and the electoral vote in recent presidential elections indicates that any Democratic advantage in the Electoral College is extremely small and could easily be overcome if the Republican candidate wins the popular vote by more than a tiny margin. Chart 1 displays a scatterplot of the relationship between the Democratic two-party popular vote margin and the Democratic percentage of the electoral vote for the six presidential elections since 1992 along with the estimated regression line for predicting the Democratic share of the electoral vote from the Democratic popular vote margin. There are three things to observe about the relationship shown in this figure. First, there is a very close fit between the two-party popular vote and the electoral vote — the Democratic popular vote margin explains over 96% of the variance in the Democratic share of the electoral vote during this time period. Second, the slope of the regression line is very steep — every 1% increase in the Democratic popular vote margin produces an increase of almost 4.5% in the Democratic share of the electoral vote. This means that even a fairly narrow popular vote margin for either party’s candidate can be expected to produce a decisive electoral vote margin. Finally, and perhaps most importantly, there is very little partisan bias in the translation of popular vote margin into electoral vote margin. That is, neither party has a significant advantage due to the Electoral College. Based on the results displayed in Chart 1, in order to win the 270 electoral votes needed to become president, a Democratic candidate would need to win 49.8% of the popular vote while a Republican candidate would need to win 50.2% of the popular vote. A tie in the popular vote would be expected to result in a very narrow electoral vote win for the Democratic candidate by 277 electoral votes to 261 electoral votes. However, given the margin of error in these estimates, even this very small Democratic advantage may not be real. 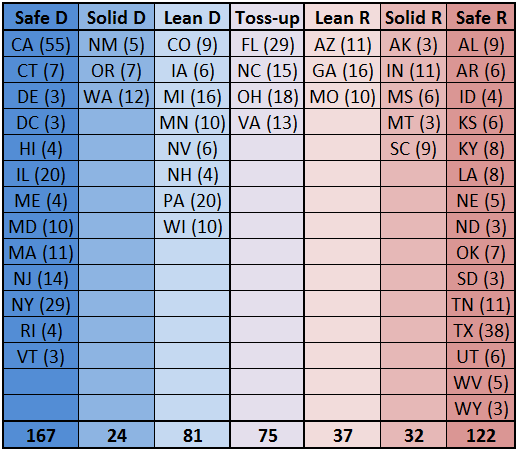 Looking back at the results in Table 2, it is apparent that it would not be very difficult for a Republican presidential candidate to carry enough states to win at least 270 electoral votes in 2016. Merely adding the three toss-up states won by Obama in 2012 — Florida, Ohio, and Virginia — to the states won by Mitt Romney would result in a total of 266 electoral votes. So the Republican nominee in 2016 would only have to add a single state won by Obama by between five and 10 points to reach the magic number of 270. Right now, Iowa and Colorado look like inviting targets given Republican victories in 2014 Senate contests in those states, and a relatively small swing in the national popular vote could put almost any of these states in the GOP column in 2016. These results indicate that the current Electoral College system for choosing the president represents a very close approximation to a national popular vote system. Of course misfires can occur if the popular vote is extremely close, as it was in 2000. However, the candidate who wins the national popular vote will almost certainly become the next president. Democratic candidates have won four of the last six presidential elections and have won the popular vote in five of the last six. The 2016 election should provide a critical test of the theory that the Democratic Party now enjoys a significant advantage in presidential elections as a result of demographic trends, generational replacement, and the growing liberalism of the American public on a variety of cultural issues. The Democratic nominee in 2016 will not have the first-term incumbency advantage that helped Barack Obama win a second term in the White House in 2012 despite slow economic growth and mediocre approval ratings. This is an important electoral factor: The only first party-term incumbent to lose a bid for reelection in the past century was Jimmy Carter in 1980. Without that advantage, history indicates that the Democratic candidate will need President Obama’s approval rating to at least be in positive territory and the U.S. economy to be growing briskly during 2016 in order to extend the Democratic hold on the White House beyond eight years. In addition, the nomination of a Tea Party candidate by the GOP would almost certainly aid the Democratic cause in 2016. Given the track record of successor candidates in presidential elections, a Republican victory in the 2016 presidential election would not be surprising despite long-term demographic and cultural trends that seem to favor the Democratic Party. Should this happen, however, Democrats will be able to take some consolation from the fact that having a Republican in the White House is the most likely scenario that could eventually restore Democratic control of Congress. There is clear evidence of a presidential penalty in American politics: The party that controls the presidency almost inevitably sees its power erode in Congress, especially in the House of Representatives. Since 1992, Democrats have won a majority of seats in both chambers in three of five elections under Republican presidents but in none of the seven elections under Democratic presidents. Democrats have won an average of 233 House seats and 52 Senate seats in elections under Republican presidents compared with only 203 House seats and 49 Senate seats in elections under Republican presidents. It is not entirely clear why the party controlling the presidency generally sees its power diminish in Congress, although the prevalence of negative voting in midterm elections is certainly part of the explanation. But whatever the cause of this phenomenon, the implication is that as long as the overall balance of support between the two parties in the electorate remains very close, periods of one-party control of government are likely to be brief. Regardless of which party captures the White House in 2016, divided government is likely to prevail most of the time for the foreseeable future. Given the deep ideological divide that exists between Democrats and Republicans, that means that we can probably expect to see a continuation of the politics of confrontation and gridlock in Washington for the foreseeable future as well.